The First Flight of A2F-1 Intruder BuNo. 147864 occurred on April 19, 1960. The A2F-1 designation stayed with the airplane until October 1962 when Secretary McNamara, who had been having trouble with Navy airplane numbers (e.g. the first version of Grumman's second attack airplane), decided to simplify the system by numbering anyone's attack airplanes sequentially; hence, the A2F-1 became the A-6A. The first airplane had been fabricated in Bethpage and was trucked out to the Peconic River facility at Calverton on eastern Long Island where the airport was free from the housing congestion that had built up around Bethpage. After several days of engine runs and system checks, we began taxi tests consisting of low speed testing of brakes and nose wheel steering, progressing to higher speeds and energy levels. When we were confident of the brakes, we performed several lift-offs utilizing our 10,000 foot runway. A lift-off is a light-weight take-off with an immediate cut in power to land straight ahead on the remaining runway. It does not count as a flight since, in the trade, you have to make a turn to call it a flight. It does give the pilot a feel for longitudinal controllability in ground effect. It also gives some assurance that nothing critical to flight is wired through the weight-on-wheels switch. Satisfied that we had checked everything we could on the ground, we scheduled the airplane to fly. This becomes something of a production. Flight test instrumentation must be checked and ready. The No. 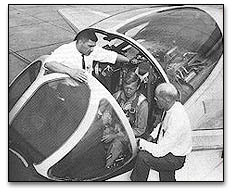 1 airplane had no weapons system installed; instead, it carried instrumentation in the form of a photo panel and oscillograph which would record a significant number of airframe and engine parameters for post-flight perusal by the engineering staff or by the accident board if such were required. Supporting personnel, consisting of chase crews, engineers in the ground communication facility, crash crew, photographers, etc., had to be briefed and coordinated. When all are up and running and the weather is CAVU, the flight may proceed. Now, the real purpose of a first flight is to make a successful landing. There is a tremendous level of interest at this point. Hundreds of people have worked long hours for months to reach this point; a large part of the company's future is tied to the airplane's success; and the customer is anxious to see what he's buying. All this creates a great deal of pressure on all concerned. One person has it within his power to bring instant relief to all hands: the lucky guy who gets to make the first flight. This is no time for an ambitious flight profile that touches all corners of the envelope. A simple plan involving exercising the operable systems, looking at basic handling qualities, posing for some photos, making a fly-by for the assembled crowd, and landing safely is appropriate. This accomplished, everyone knows great joy! The airplane is put in the hangar, everybody attends the party, the customer returns to Washington, and the next day you prepare for the real start of the Flight Test program on the second flight, when peace and quiet prevail. The first flight was flown solo for two reasons which seemed a ppropriate at the time. The tactical side of Grumman was strictly single-pilot aircraft with no professional non-pilot aircrew. Secondly, we thought there was no sense exposing another person to potential danger if it was not necessary. So, on April 19th of 1960 we rolled down runway 32 at Calverton on the maiden voyage of the A2F-1. Ernie Von der Heyden, the Project Pilot, was chasing in an F9F-8T with a photographer in back. Our rescue helo and a company G-21 (Grumman Goose) for water rescue were airborne. We climbed out to 10,000 feet before raising the landing gear, as a precaution against any unusual trim change or some hydraulic mischief. Unfortunately, we got a barber pole on one of the gear indicators and returned the gear to the down position. They all locked down and prudence dictated leaving them that way. This interfered with the modest profile we had planned, so we just flew around in the 10,000 to 15,000 foot altitude range getting a feel for the handling qualities, which were quite good. We also exercised the engines, since this was the first time the P&W J-52 was in a manned airplane. Its prior airborne experience was in the Hound Dog missile on the B-52. I can't remember a problem on this flight, but we soon found compressor stalls on rapid engine decels which required a bleed valve modification. I believe we were the first to coin the word "chugs" to describe the stalls. We also checked the tilting tail pipes which worked beautifully. The A2F tail pipes normally bend down seven degrees with respect to the fuselage reference line. To satisfy a Marine Corps requirement for short takeoff roll, the tailpipes incorporated a hydraulic actuator which deflected them down to thirty degrees when activated by the knurled knob on the outboard throttle. There was no trim change as I recall, they reduced the power on stall speed by five knots, or for a given approach speed they reduced the angle of attack by three degrees. The first Navy Evaluation team, led by Swoose Snead, was charged with seeing whether this feature was worthwhile. They found that they were only marginally effective for the Marine Corps requirement, and as for anything they had seen since propeller days. They recommended deleting the tilting tail pipes at a cost saving of $25,000 per airplane! Actually, the concept would have worked well on the heavy weight EA-6B much later on. After some in-flight photos (fortunately wit h the gear down) we came in for our fly-by and landed, one hour after takeoff. A photo taken on landing shows the airplane with tail pipes and fuselage speed brakes extended; an interesting configuration. Since the fuselage brakes were effective thrust spoilers we later found that Vmax with full throttle with gear down and brakes out was 109 knots! As you all know, the fuselage brakes were eventually bolted in and wing-tip brakes were installed. On the second flight Ernie Von der Heyden took the left seat and I moved over to the right and we would alternate left and right on subsequent flights. On this flight we got the gear up with no barber poles and began our speed build up. At 283 knots we felt a bang and the chase pilot said our left boarding ladder had carried away and landed in Long Island Sound. The latching mechanism was redesigned before the next flight two days later. In all, we flew eight flights for 8.6 hours before the official Navy Acceptance day on April 29th. On this occasion the airplane had a new gray paint job (not the bare metal of the first flights) and the name Intruder painted on its nose. I think this airplane is now on a pedestal at NAS Whidbey Island, or I believe it was.